"A Keyblade with long reach that provides an outstanding boost in Strength and deals higher damage when you land a critical hit." 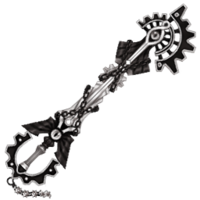 The Void Gear, also known as Vanitas's Keyblade (ヴァニタスのキーブレード, Vanitasu no Kīburēdo? 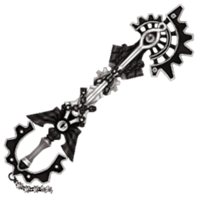 ), is the default form of Vanitas's Keyblade and a Keychain for Terra's, Ventus's, and Aqua's Keyblades which appears in Kingdom Hearts Birth by Sleep. Vanitas is able to wield this weapon because he is the embodiment of fellow Keyblade wielder Ventus's darkness. As Vanitas's lingering spirit, Vanitas Remnant wields a monochrome version of the Void Gear. It is also utilized by the replica incarnation of Vanitas. In the North American, PAL, and Final Mix versions of Kingdom Hearts Birth by Sleep, Terra, Ventus, and Aqua are rewarded with this version of the Void Gear for defeating Vanitas Remnant. The Void Gear's teeth and head are black with a red outline and possesses a round, cog-like shape. The handle is red and the guard has the same coloration and cog-like shape as the teeth. The shaft is predominantly colored in shades of grey and sports a copper-colored gear in the center, with two intersecting, black chains wrapped around it. Two more chains are wrapped around the base of the shaft in a similar fashion. It also has two Gazing Eyes: one located in the head of the blade and one embedded in the hilt. Its Keychain is comprised of three small, copper gears and ends in a charm resembling two halves of a gear arranged in an S-shape. Vanitas Remnant wields its own, monochrome version of Void Gear. Its design is identical, save for the color scheme. The guard and teeth of the Keyblade, as well as the chain wrapped around its shaft, are all black. Its shaft is white and the two eyes on it are grey. The Keychain and token are also grey, reflecting how the Vanitas Remnant is what's left of Vanitas after fighting Ventus. The Keychain that Terra, Ventus, and Aqua receive is based on this version. The Void Gear's name references the gears and cogs that make up its design, as well as Vanitas's own name, which means "emptiness" in Latin. Vanitas wields this Keyblade against Terra, Aqua, and Ventus. "Vanitas's Keyblade" is an Avatar Part. The token of Vanitas's Void Gear. 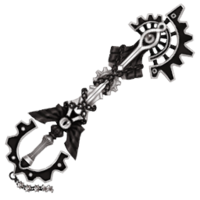 "Vanitas's Keyblade" Accessory in Kingdom Hearts Re:coded.